Google does so much for educators around the world ... and I want to help them with their mission. 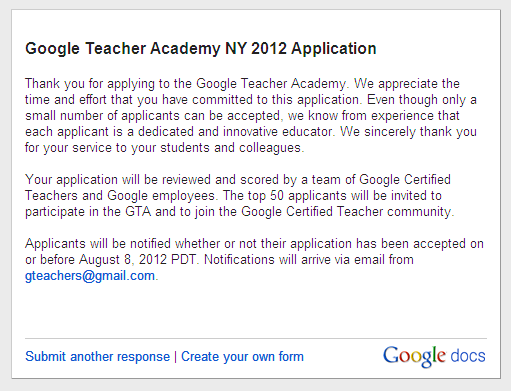 That's why I applied to the 2012 Google Teacher Academy in New York City today. The GTA is looking for educators that are proficient in Google Apps for Education and are able to lead professional development for other educators. I decided to create my video on "Classroom Innovation". To demonstrate how I use the latest technology tools and best-practice teaching strategies in order to improve student achievement. Help me, help Google, to help our teachers provide the most innovative learning experience for our 21st century students.